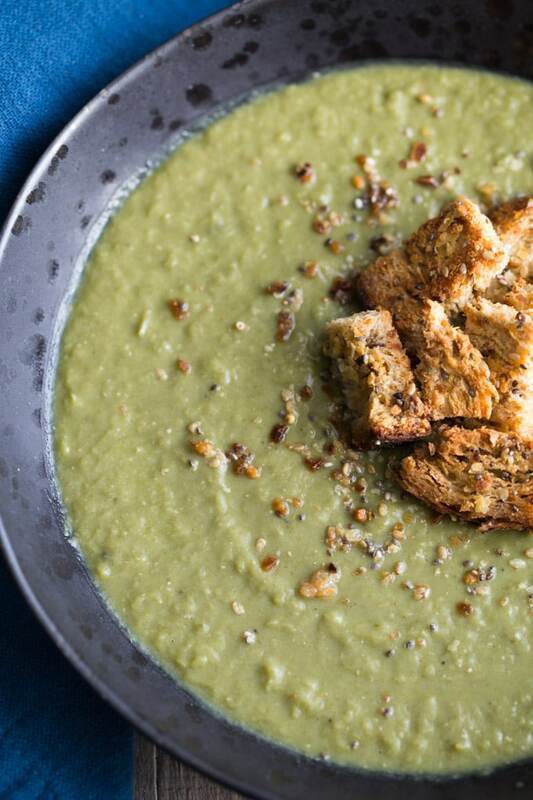 What’s a clean and green January challenge without a creamy bowl of veggie packed soup with crunchy croutons? 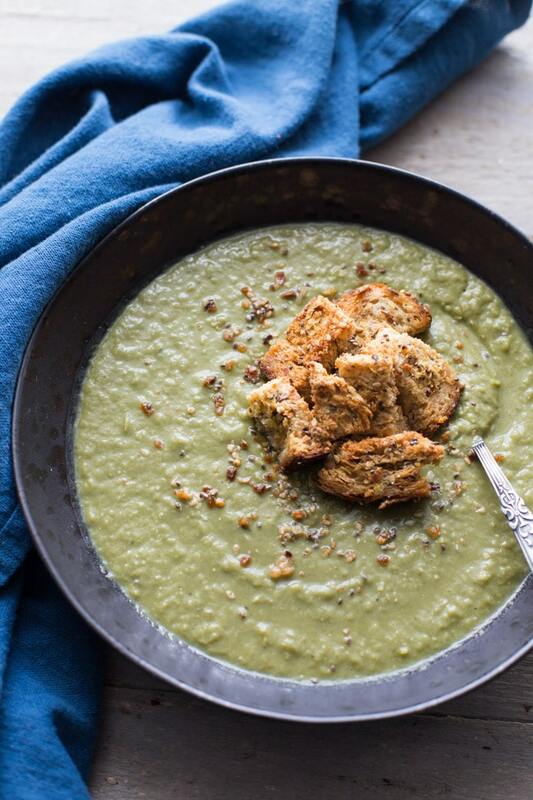 Meet my latest lunch date – Spicy Sweet Green Pea Soup with Everything Bagel Seasoned Croutons! This month has definitely been a month of soups in our house. My husband gave me an Instant Pot for Christmas, so I’ve been spending some time experimenting with different recipes. And since it’s cold outside, soup is at the top of my recipe list! From chunky vegetable to creamy purées, I’ve made them all this month! But this Spicy Sweet Green Pea Soup is my favourite so far. For someone clean eating and trying to incorporate green veggies into every meal (which is my challenge this month! ), this soup is creamy, comfort food at its healthiest. It’s packed with green, leafy spinach and sweet green peas. So you get a lot of greens in your meal without even trying! The soup is rich in flavour from the fresh garlic, cumin, jalapeño pepper and leeks (and yes, I added jalapeño and leeks because I had so much leftover from my last recipe)! It’s completely dairy-free, so it’s not loaded with heavy creams, only a touch of almond milk. And it’s topped off with homemade everything bagel seasoned croutons! So let’s talk about these croutons for a minute. These crunchy gems are made with ancient grains bread, evoo, everything bagel spice and nutritional yeast, which adds a cheesy flavour to the garlicky everything spice. 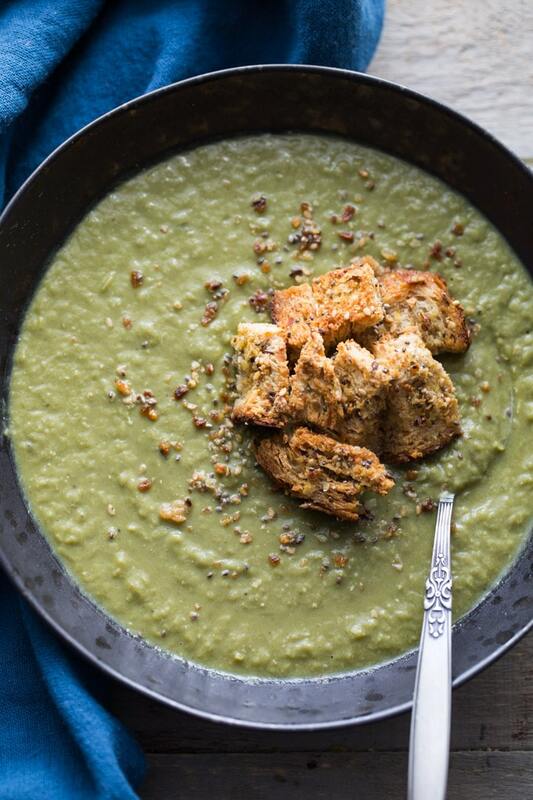 The crunchy, salty contrast of the croutons is the perfect match for the spicy, creamy pea soup. And the crumbs from the croutons add a nice little garnish too! Obviously, the croutons are totally optional, but I highly recommend them! This soup is totally customizable to your tastes. You can add more or less jalapeño and cumin, depending on your tolerance for spice. The amount in this recipe results in a mildly spicy soup. And if you’re not a fan of super thick soup, you can just add a bit more almond milk. I like mine thick, so I only add 1/4 of a cup. The almond milk will also help take the edge off the spice. This Spicy Sweet Green Pea Soup can be easily made on the stove top or in the Instant Pot. I’ve included instructions for both in the recipe below. To be honest, the stove top is a little quicker, but I love the Instant Pot because, once the pressure builds, it cooks pretty fast. The peas actually over-cook a bit, resulting in a mixture that is easily puréed with the hand blender and it turns out super creamy. 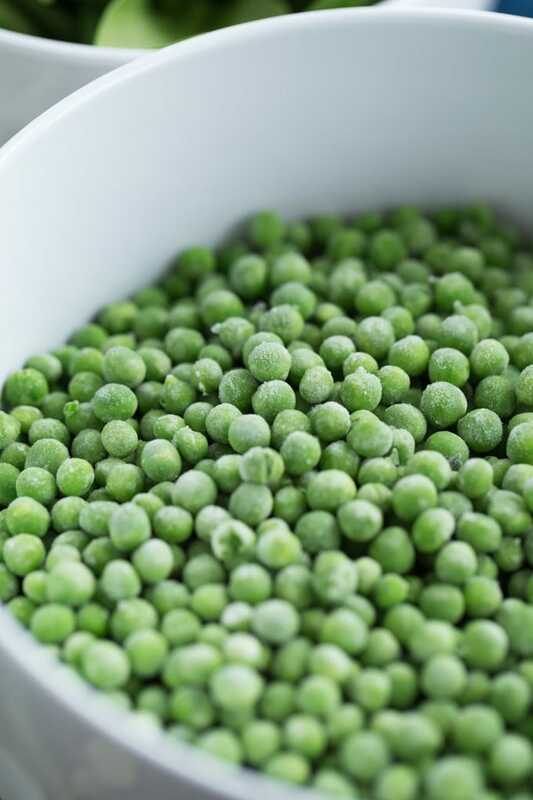 It’s actually creamy, with little bits of peas remaining, which creates a nice texture. 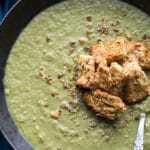 If you make this Spicy Sweet Green Pea Soup, be sure to let me know if you use the stove top or the Instant Pot. I would love to know your preference. And I’d also love to know if you have an Instant Pot, and if so, what types of things do you love to cook in it? 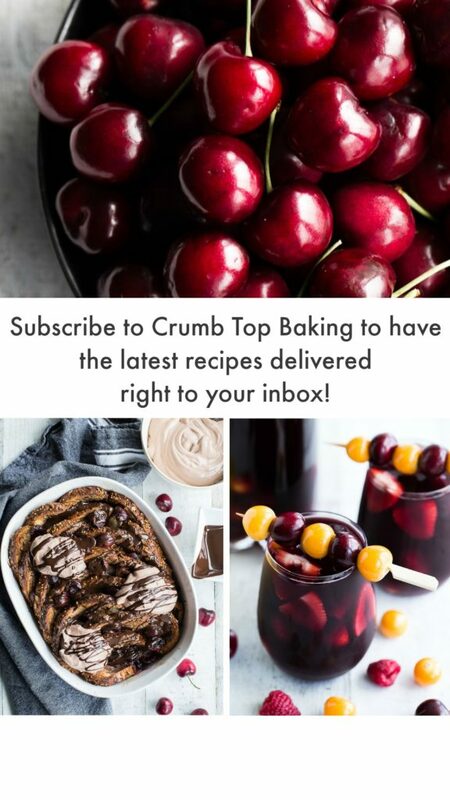 As usual, if you make this recipe, please take a pic and share on Instagram by tagging @crumbtopbaking! Spicy Sweet Green Pea Soup is packed with green peas, spinach and leeks, and spiced up with jalapeño peppers, cumin and garlic. Super creamy but dairy-free! 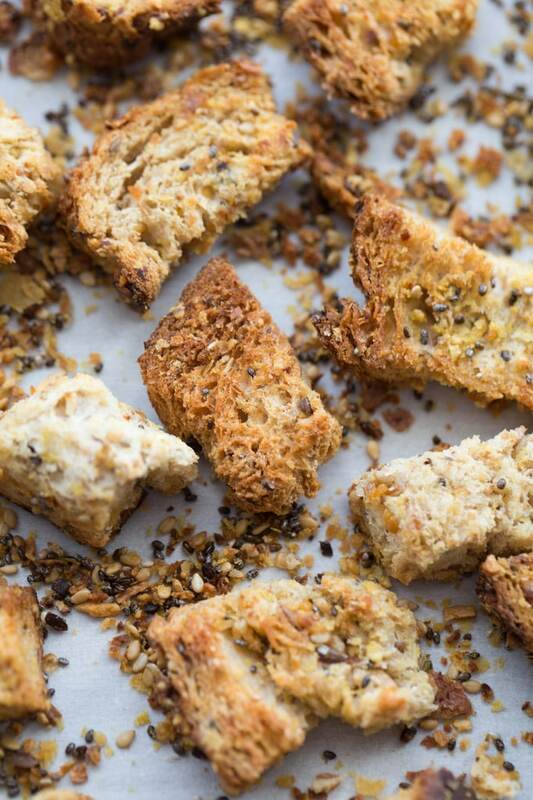 For added taste and crunch, serve with homemade Everything Bagel Seasoned Croutons! In a medium-sized bowl, add the cubed bread and drizzle with olive oil. Sprinkle on the nutritional yeast and everything bagel spice. Mix with your hands until the cubes are well coated. Don’t over-mix as the bread may start to crumble. Spread the croutons out in a single layer on the prepared baking sheet. Bake for approximately 20 minutes, flipping the croutons after 10 minutes. Keep an eye on them to ensure they don’t start to burn. They should be browned and crispy. Add the olive oil, spinach, garlic, leek, jalapeño, salt, pepper and cumin to the Instant Pot and select sauté. Cook for 5 minutes, stirring frequently to ensure the garlic doesn’t burn on. Add the broth, peas and thyme and cook on normal pressure for 5 minutes. Use a quick release to depressurize. Transfer the mixture to a blender, or purée in the pot with a handheld blender. Blend until the mixture is thick and creamy with some bits of peas still remaining. If you like it a bit smoother, blend for a little longer. Stir in the almond milk. Pour into bowls and garnish with croutons. To make this soup on the stove top, in a large pot, add the olive oil, spinach, garlic, leek, jalapeño, salt, pepper and cumin. Cook over high heat for 5 minutes, stirring frequently. Add the broth, peas and thyme. Cover and bring to a boil. Reduce heat, and cook on a low boil for 5-7 minutes. Purée in blender or with a hand-held blender until thick and creamy. Stir in almond milk. This recipe is totally customizable. To adjust the spice, just add more or less jalapeño and cumin. If you like it creamier, just blend for longer. And if you like it a little thinner, just add a little extra almond milk. I use Epicure‘s Everything Bagel Spice, but I’ve also made my own by using a recipe by Two Peas and their Pod. If you like your croutons with extra garlic flavour, you can sprinkle on additional everything bagel spice and reduce the amount of nutritional yeast. This soup looks so delicious! I love that you can use frozen peas, very convenient. And those croutons! I could eat those as a snack! My husband’s not convinced the Instant Pot cooks food that quickly. I can’t WAIT to show him this delicious recipe as more proof I need an IP in my life! I’ve had split pea soup hundreds of times in my life, but I’ve never eaten spicy-sweet green pea soup before! Since I’m not on the IP bandwagon yet I’ll have to adapt this recipe for the stovetop because it looks incredible! Pinning! Thanks Christina! This recipe is quick and easy to make on the stove top too! I hope you like it! Let me know how it goes. Such a nutritious soup, Leanne, and the croutons are definitely not optional, in my opinion. I eat those straight off the sheet pan like potato chips, lol. You do that too??? I have the original Instant Pot, lol, It’s a Breville 6 in one unit with pressure cooker, slow cooker and all that stuff. I love using mine in pressure cooker mode for quickly cooking proteins. So convenient! Hope you have a fabulous weekend!!! Oh yes, I’ve totally snacked on the croutons right off the pan! I couldn’t resist! I’ve mostly used my Instant Pot in pressure cooker mode, but haven’t experimented much with the other modes yet. It can make yogurt apparently, so perhaps I’ll give that a try! 😉 Happy weekend to you too, Dawn! Pea soup gets a bad rap for its colour – but it is SO good. I love this spicy version!! And those croutons? This is lunch perfection, Leanne!! I love that color!!! I have tried a pea soup before and hated it..But this, this sound so yummy to me! I want to try this real soon! I am glad that I can use frozen peas in this, which makes it super convenient. And I love those croutons on the top! Thanks Deepika! The frozen peas really make this soup quick and convenient. Hope you get a chance to try it! Be sure to let me know if you do. I got my Instant Pot in the fall and didn’t really get around to using it until last month. I’m hooked now! 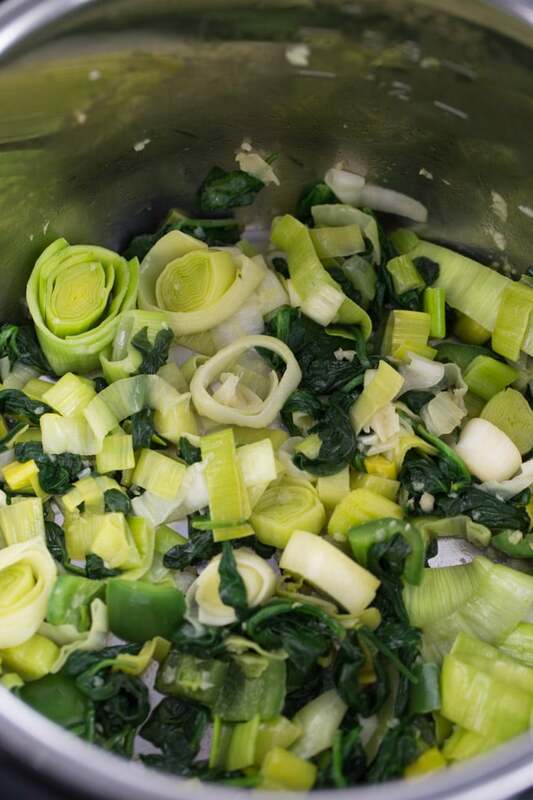 I love all of the green goodness packed into this soup Leanne — it sounds wonderful! Thanks Marcie. I’ve only had my Instant Pot for a month, so I really need to spend some time experimenting with it more. As for this soup, it’s definitely packed with lots of greens! Happy Sunday! This crouton idea is just genius! I love everything bagel seasoning, and just found another way to use it. Thank you for the inspo! Thanks HeeJee! I’m a big fan of everything bagel seasoning too. Glad you like this crouton recipe! Thanks Puja! I hope your family likes it. Let me know how it goes! 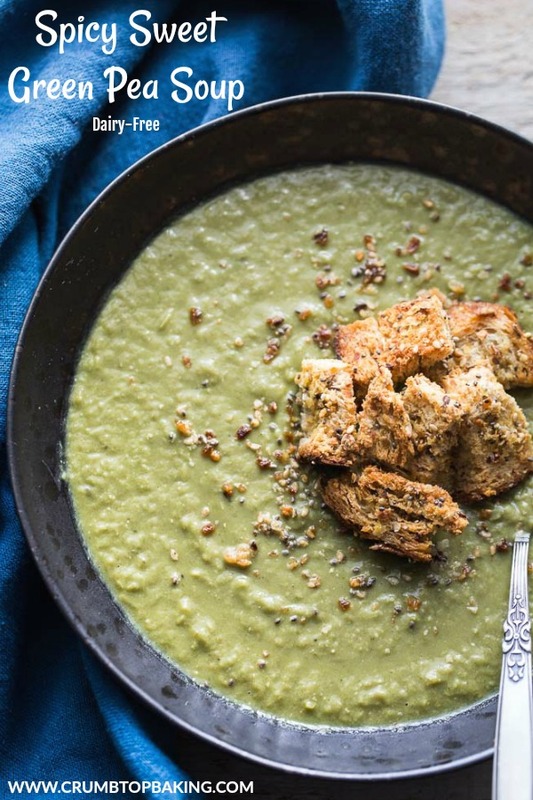 I am a huge fan of split pea soup and your everything bagel croutons take it over the top! This looks wonderful! I love pea soup Leanne. Reminds me of growing up. My mother used to make it often during the winter! This looks soooo good! Those croutons look fabulous too! I almost forgot to tell you, I tried this recipe on my stove top (with a few adaptions due to what I had on hand) and it was spectacular! Both the hubbers and I gobbled it down! This recipe WILL be made again!